I have been wanting to make some version of champagne cupcakes forever. First it was Valentine's Day. What a perfect date night treat and so romantic. Never happened. Then it was my sister's surprise engagement party but my mom had already ordered professional cupcakes and I wasn't going to compete with those. So when it came time for my parents' surprise 30th anniversary party (can you tell we like surprises around here? ), I knew exactly what I would be making. I was expecting these to be good but I was not prepared for how good they really were and how much they really tasted like champagne. You could actually taste the bubbles in every bite. The cake part was not too sweet and little bit savory (thanks to the surprising addition of sour cream to the batter) which paired perfectly with the sweet and bubbly champagne buttercream icing. People went nuts for these at the party and I ended up making them later in the week for family members who didn't get to have one the night of the celebration. I made them in mini form (obviously) and I think that they might be too much in regular cupcake form. My friend Carrie had the genius inspiration to use the left over buttercream to fill strawberries and raspberries and people couldn't get over how great it tasted. All in all the fruit and cupcakes made for a super cute dessert display. You can probably tell that I had way too much fun taking photos of these so please bear with my excessive pictures. 1.) In a stand mixer, cream together the butter and sugar until light and fluffy. 2.) Add in eggs one at a time and then vanilla mixing well after each ingredient. 3.) Combine the rest of the dry ingredients together and set aside. Then whisk together the sour cream and champagne/prosecco. It will bubble, it will seem weird, but believe me it works. 4.) With the mixer on medium, add in half the dry ingredients, then the entire sour cream champagne mixture, followed by the rest of the dry ingredients making sure the batter is well combined but not over mixed. It will be pretty thick. 5.) Fill muffin liners/tin a little more than half way full. These will bake up nicely. Bake at 350 degrees and I baked the minis for about 12 minutes. You will want to adjust for different sizes. They are done when the tops are just starting to look golden and are firm to the touch. Let them cool completely. 2.) Once it has reduced down to about two tablespoons, remove from the heat, transfer to a small bowl and let it cool. 3.) In a stand mixer using the whisk attachment, cream together butter and sugar. 4.) Beat in reduced champagne plus the extra tablespoon of regular champagne and whip until light and fluffy. It will seem watery at first but should fluff up soon. Butter and champagne: a match made in heaven? 5.) Using a pastry bag (I used a Wilton #30 tip), ice your completely cooled cupcakes and decorate them any way you like. Check out the Spiked! 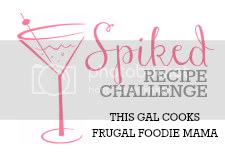 Recipe Challenge for more champagne recipes! Aww, Aunt Beth, I wish we did too. I would love to be able to learn from you. Justin and I had a dessert on my birthday at a restaurant that had a toffee layer that tasted exactly like your/Grandma Collins' homemade caramels. Miss you all! Super cute post! And these cupcakes sound like a must try! Thank you! Oh my word! I seriously NEED to try these! What a perfect treat for a special occasion. And yay for enough champagne left over to drink while baking! I have been dying to try these! Thanks for the recipe! These sound delish! I can't wait to try them! Thanks for sharing. I'm a big fan of champagne. I'd love to try these. Oh my goodness these look amazing. And we love.love.love prosecco! Thanks for sharing on Tout It Tuesday! Hope to see you next week. 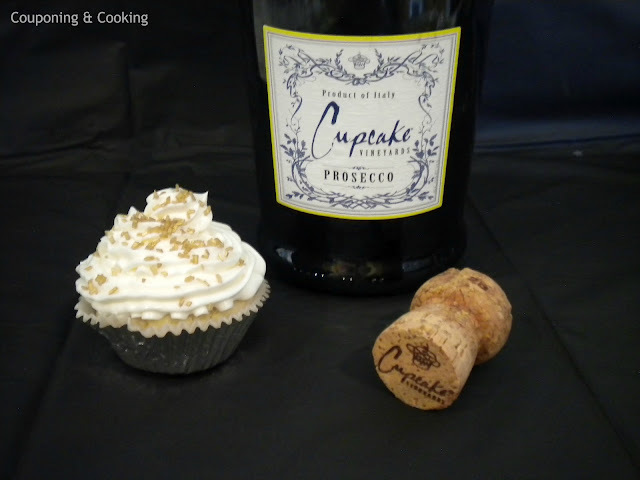 I have wanted to make champagne cupcakes for a while now, and I am so glad I found your recipe! Your cupcakes look gorgeous!I can't wait to try these! Thanks! I am glad you took so many photos. I enjoyed each one. Great job with the cupcakes and such elegance. I am thrilled, they are now in the Recipe Box. Would love for you to share at my link party. Hope to see you there! We have always loved champagne cake, you can get a pink one with white frosting at one of our fave bakeries, Smith's in Southern Cali. Your dessert looks really good. 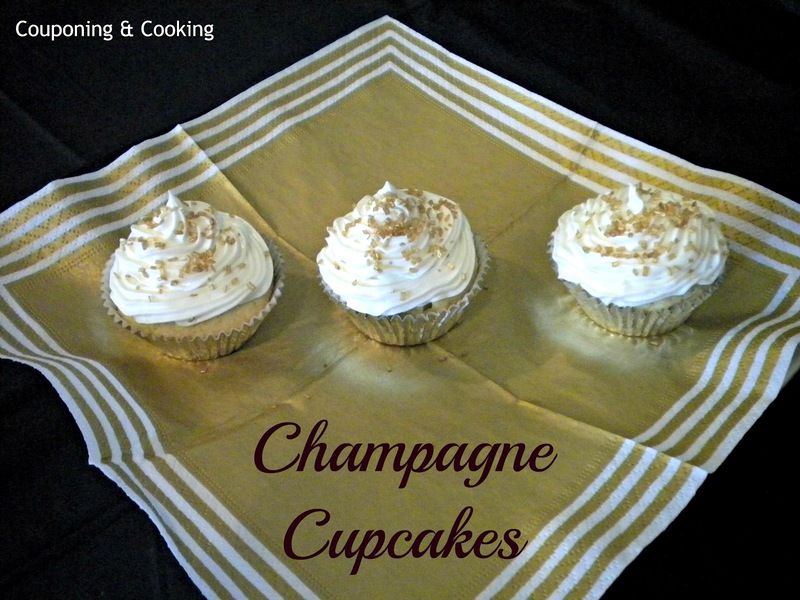 Surprising when we lived in Michigan for a while, no one seemed to know about champagne cake. I had to learn to make my own long ago. yum, they sound great and are adorable too! these look fabulous. 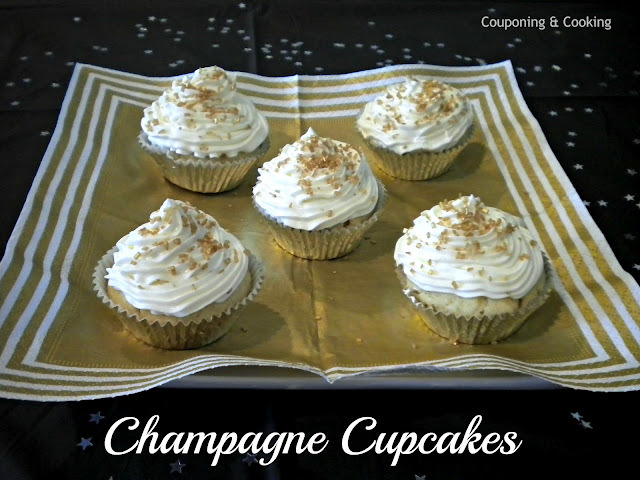 i may try to make them with moscato instead of champagne...thats my favorite! i especially like the sugar you put on top. it made them look especially classy! What a terrific adult cupcake... I like your choice of prosecco very funny. Please share these on my foodie friday party today. I will pin them too. 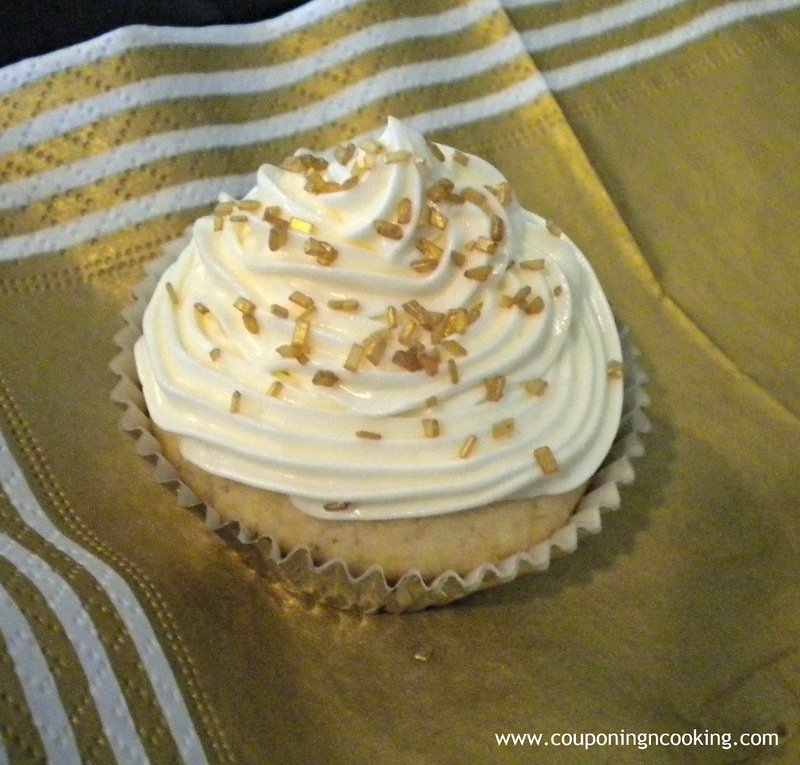 I'm so glad you shared these... looking at this recipe again - I think this is the most interesting cupcake recipe I've seen. 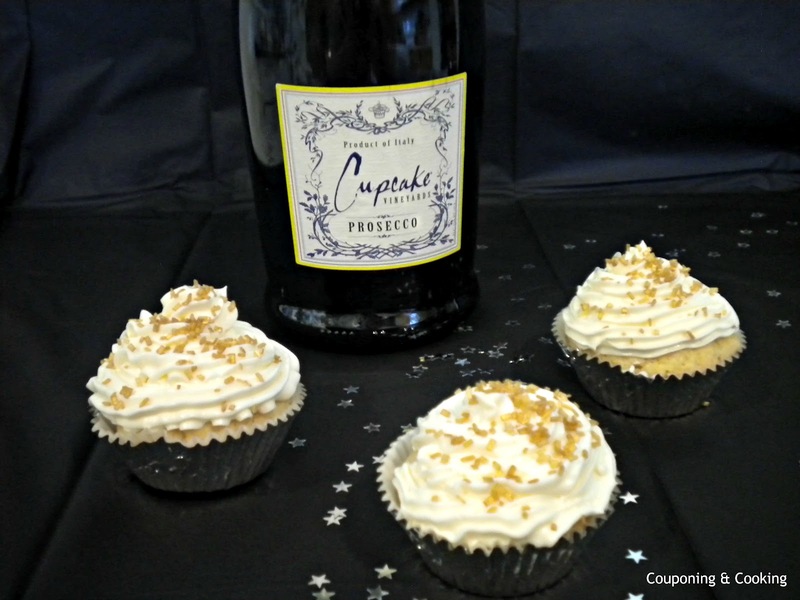 Congrats, you shouldn't be too surprised that I am featuring your cupcakes on my foodie friday party today. I love this recipe. Stop by and grab your featured button. I cannot wait to try this! Thanks for sharing at the Pomp Party! Pinning to our Pomp Party board! Thanks so much for linking up to Heavenly Treats Sunday! I am pinning these, because i will be making these, they look delicious! I just may make these for my own anniversary coming up in July. They look like they would be delicious and they are so pretty! Kaylee!! These look FABULOUS!!! Like REALLY!! Yum! How fun! And they look so YUMMY. Thanks for sharing on the Creative Corner Hop. I'm visiting here from Simple Living's Foodie Friday because I just had to see your champagne cupcakes for myself. Wow. Just wow. I'm totally pinning this. This will be a hit with my girlfriends. I can't wait to try it! I also host a weekly foodie blog hop called Friday Food Fight. I would love for you to link up your cupcakes and any other recipes you'd like to share. I hope to see you in the ring! Genius and delicious! I'm going to have to make these for the next special occasion I have...or just because! Photos were great -- and looks like the cupcakes would be fabulous! Pinning! Thanks for sharing on Busy Monday. Oh my gosh! I have always wanted to make these! They are so pretty. I am featuring this post tomorrow at Wednesday's Adorned From Above Link Party from Adorned From Above's Link Party 24. Thank you so much for sharing this recipe. These cupcakes look delicious. These are beautiful! Thanks for linking up at Show Me You Plaid Monday's! These sound amazing. Sound like a good thing to make for New Year's Eve tomorrow. Thanks for sharing!!! YUM! I've made cupcakes with Reisling and Merlot, but never champagne! I'm totally doing this! Thanks for sharing at the Humble brag! Yummy! These look great! I'm participating in the challenge as well. Good Luck! Come visit me at My Sesame Seed Buns sometime!